The conjunctiva is a thin layer, which covers the whole Sclera or white part of the eye. It forms a protective layer which runs all over the surface of the eye up to the cornea and up to the margins of the eyelids. This also makes conjunctiva, along with the eyelids, the first line of defense for the dog eye. For this reason, canine conjunctivitis is considered the most common dog eye problem. A dog with red eye is caused by a number of infectious, non infectious and predisposing factors in the environment to which this thin layer is exposed. In infectious causes of dog conjunctivitis or dog pink eye, viruses, bacteria, parasites and some species of fungus can cause significant levels of inflammation on the eye surface, which is the swelling of the thin layer of conjunctiva. Infections and infestations may spread to conjunctiva from the face, eyelids or from other deeper parts of the eye. Allergies are another cause of dog conjunctivitis, which can be due to seasonal allergens, food allergens and the allergies caused by parasites and insect bites. Traumas, eyelid problems and intrusion of foreign particles such as dust, sand, pollens, pollutants, hairs etc can cause inflammation of the conjunctiva. 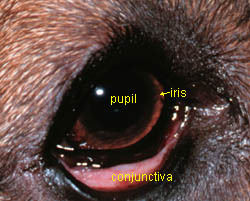 Since the conjunctiva lies over the whole eye sclera, from the margins of the eyelids to the cornea of the eye, eyelid and corneal diseases significantly cause canine conjunctivitis as secondary problem. Since canine conjunctivitis is an inflammatory response, classical symptoms of inflammation appear such as swelling, redness (hyperemia), pain (irritation) and partial loss of function. Along with these typical inflammatory symptoms, the specific clinical representation of dog conjunctivitis includes swelling on the margin of the eyelids, excessive dog eye discharge and redness over the surface of the eye. This leaves the conjunctiva with a meaty appearance, which is prominent at the base of the eye, near the margin of the lower eyelid. An affected dog will be in discomfort and will rub and scratch its eyes due to irritation and scratching, which introduces the risk of self injury and secondary complications such as corneal injuries, eyelid injuries and deeper injuries from stabbing the eye. Similarly, untreated dog eye conjunctivitis cases may worsen and deeper layers and parts of the eye may become inflamed over time resulting in a “Harder to Heal” (HtoH) mode of dog eye problems. Even though conjunctivitis in dogs is considered common, it is a relatively minor issue. It is necessary to determine the exact underlying cause in order to select an effective treatment approach. A dog's clinical dog eye symptoms and history can help in identifying canine conjunctivitis, but these can never confirm the exact cause of it, except if the cause is any solid matter visible on the eye surface, causing a triggering of an inflammatory response. Infectious and allergenic causes can only be confirmed through laboratory diagnosis. Usually, confirmation is not made for minor conjunctivitis cases, but if the condition is recurring and is causing damage to other parts of the eye, confirmation is mandatory for effective treatment and prevention of the underlying cause. Laboratory tests, such as tear tests, culturing, isolation, sensitivity and allergy tests may help in confirming any underlying infectious causes of the conjunctivitis. Detailed Ophthalmology is usually needed in chronic cases, and in those cases where an underlying cause is suspected to be any anatomical deformity, like that of eyelid, cornea, sclera or tear duct etc. It is always recommended that dogs with clinical dog conjunctivitis or a dog with red eye should be handled immediately, in terms of diagnosis and treatment. Once the underlying cause is confirmed, treatment should be started at once. Any underlying cause should be specifically treated with antibiotics, antihistamines (anti-allergic) and steroidal eye preparations such as drops, ointments, creams etc. In the symptomatic mode of treatment, anti-inflammatory drugs and steroidal preparations can be combined in the form of dog eye drops and ointments to control the severity of swelling, pain, irritation, redness and any pressure over any dog eye parts. Similarly, dog eye care during the healing process is necessary. For example, the patient should be kept in a hygienic environment and causative factors should be avoided. Along with this, dog eyes should not be exposed to light for long periods of time and the eyes should be drained and kept irrigated at all times. This can be done with isotonic dog eye solutions (formulated to match natural eye fluid), and some commercially available natural remedies including Eye Heal to improve overall dog eye health and i-Clenz to safely clean and care for areas around the outside of the eye. Care should be taken to keep the dog from rubbing its eyes in order to avoid any self injury. Some anatomical deformities, such as those that affect the cornea, tear ducts, sclera, eyelids and eye ball can cause inflammation of the conjunctiva which might need to be corrected with a minor or major surgical procedure. 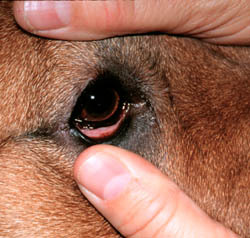 Owners should never try to treat chronic and/or complicated forms of dog conjunctivitis or dog pink eye.